The way you walk can give you and your doctor clues about your internal health. Most of us just assume that changes in gait (defined as the way you walk) are an inevitable part of aging. But as it turns out, an unsteady gait can reveal what's going on with your overall health. Our ability to walk has a great influence on our quality of life. 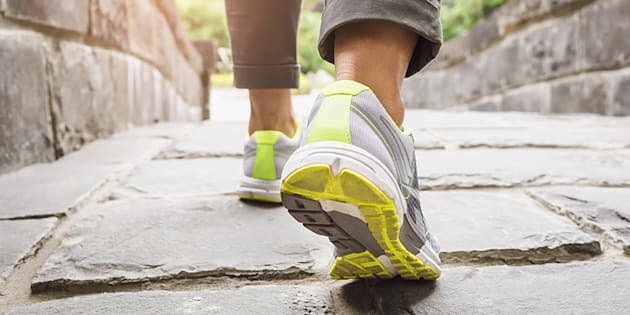 Difficulty walking makes it difficult to fulfill an active lifestyle and a slow, shuffling and unsteady gait can affect you earlier than you think. According to a study on gait and balance disorders, 30 per cent of adults over 65 years of age have difficulty walking three city blocks or climbing one flight of stairs, and 20 per cent walk with a cane or other aid. By the time we reach 80 years old, over 60 per cent of us will have a gait disturbance. There are many reasons why an underlying medical problem could change the way you walk or affect your balance. According to the American Family Physician, changes in gait usually don't come from one particular issue. The way you walk can be influenced by a number of factors and your gait can give you and your doctor clues about your internal health. In an analysis of patients with rheumatoid arthritis, patients experienced a significant reduction in joint motions in the hip flexor, knees and ankle which affected their gait. Those with joint-related pain may also develop an antalgic gait, which is being in an unnatural position in order to avoid pain when walking. If you've been diagnosed with diabetes, a change in gait could mean your diabetes is not as well controlled as it could be. Nerve damage to the feet or legs, known as peripheral neuropathy, can result in pain and numbness in the feet which affects the way you walk. A doctor, testing the sensibility of a patient's foot. This test is often used for checking neuropathy of diabetic patients. XXXL size image. A Harvard study found a strong link between abnormal gait and high blood pressure. Hypertension or high blood pressure can lead to balance problems and change the way we walk. Luckily, once blood pressure comes down as a result of medication or changes to diet, gait often returns to normal. Scoliosis, an abnormal rounding of the spine, can put great stress on the rest of our body, affecting our gait and posture. Unfortunately our spines naturally start to curve as we age. "Aging is a kyphotic process. As we get older, our spinal column shrinks and our height generally decreases," says neurosurgeon Abhishiek Sharma. Adding to that, "our bone quality deteriorates and that causes loss of height at different levels in our spine." If our spines continue to curve, this makes walking difficult. It's important to talk to your doctor when you notice a change in your gait. An issue with gait is also the most common cause of falls, so it's even more imperative to address changes right away. A non-invasive test can be done to assess your gait. Your doctor will watch you walk and note the speed and length of your strides. Dr. Bruce Pinker is a foot and ankle surgeon in New York who performs such tests. "Often, I perform a gait analysis for my patients where I study how they walk. I look at their shoulder tilt, arm swing, heel contact, and toe-off," says Dr. Pinker. "I also use a computerized gait analysis system called the F-scan. This system detects high-pressure areas in the foot that can become problematic." A gait analysis can have big benefits to your overall health. Having your gait evaluated and then following your doctor's recommendations to improve your gait has been proven to reduce the risk of falls by 30 to 40 per cent. Along with a gait analysis, your doctor will go over the medications you're taking to determine whether they may be affecting your gait and balance. Studies have shown that adults taking four or more medications at once have a higher risk of falls. Most gait disorders can be improved with interventions such as strengthening exercises. Your doctor will most likely recommend a gentle exercise program to strengthen and stretch the muscles that are responsible for walking. These muscles include the hamstrings, glutes, calf muscles and quadriceps. Other types of exercises that can improve your gait include resistance band exercises and tai chi training which rapidly builds balance and strength. Carrie Madormo is a health writer, nurse and yoga instructor. Her work has been featured on Livestrong, The List, and The Healthy Work at Home Mom.